For roughly a decade and a half Rhapsody Of Fire was one of the most popular and most innovative bands in symphonic power metal, with their particularly epic and cinematic style influencing countless new bands that have come along over the years. Then it happened: After releasing the exceptional masterpiece From Chaos To Eternity, their two main composers, guitarist Luca Turilli and keyboardist Alex Staropoli decided to go their separate ways, with Luca starting his own version called Luca Turilli’s Rhapsody, with the goal of pushing his cinematic metal vision even further, while Alex decided to keep working with vocalist Fabio Lione and Alex Holzwarth, and recruited bassist Oliver Holzwarth and guitarist Roberto De Micheli to continue under the Rhapsody Of Fire name. Luca’s first new album was released last year, and while I won’t compare the quality of the two albums any further, suffice to say I was blown away by Ascending To Infinity. But enough of that, as with their new album Dark Wings Of Steel, this new version of Rhapsody Of Fire has opted to go in a much different direction, returning to the roots of the band while adding some slight modern touches, and while it’s not a perfect album, it’s certainly very good. Over their last couple albums, it seemed Rhapsody of Fire were pushing their sound further, becoming a more progressive and more dynamic band with a more diverse approach to songwriting than the more standard symphonic power metal they were playing in their early days, with such surprises as folk elements and even black metal growls, to go along with an ever increasing emphasis on orchestras and choirs, all the while being as cinematic as possible with a ton of narrations throughout their albums, and the inclusion of at least one huge epic length track on every album. 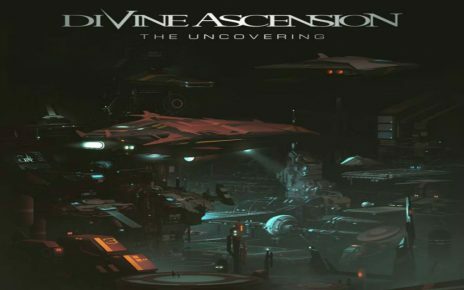 However, with Dark Wings Of Steel much of that has been taken away, and what’s left is an album that feels like a combination of their first three albums and Triumph Or Agony, except with less folk elements than the latter and more riffs than the former. One thing’s for sure: The beginning of the album will surprise no one, and I mean that in a positive way, because RoF have always been great at opening albums and this is no exception. 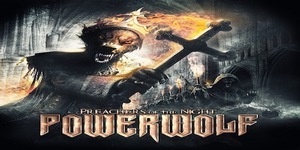 It begins with a nice intro track that’s essentially an orchestral version of the main riff for the first full song, “Rising From Tragic Flames”, which in turn is the exact kind of fast and epic album opener the band has always excelled at, with the new guitarist instantly fitting in and Fabio sounding as great as ever, The chorus is as grand as expected with some excellent choir vocals supporting Fabio. It’s after this song that the album takes a bit of a surprising turn, as the next section is both the weakest part of the album, and also the part that reminds me most of Triumph Or Agony. The aforementioned album was a bit of an odd ball for Rhapsody in that it opened with two epic fast paced songs that would fit in fine with any of their albums, but after that the vast majority of the album was very slow and surprisingly laid back, with very little emphasis on the guitar work. Well, one thing this album does differently is that even on the slower songs we still get some great riffs, but aside from that I would say tracks 3-6 are a lot more laid back than what fans have come to expect from the band, and while each song is excellent on its own, with the 8 minute “My Sacrifice” having a particularly strong chorus and a stunning solo section where Alex and Roberto keep going back and forth showing what they’re capable of, having to hear all four of these songs in a row is a little too much, especially considering that they all lack the dynamics you’d expect and there is very little speed to be found in this entire portion of the album, which is quite shocking for a power metal band. With that one little issue out of the way, I will say one thing this album does better than any recent RoF album is the use of melodies. Now, they’ve always been a melodic band and all their albums have excellent choruses, but as they got more and more progressive and dynamic, the melodies were getting a bit lost at times, where the more stripped down approach of this album allows the melodies to shine through a lot more, especially on the more classic sounding “Silver Lake Of Tears” and the title track. Another plus is that because this isn’t a concept album (at least as far as I can tell, anyway), there are none of the sometimes irritating narrations from other recent albums, and while I wouldn’t have minded having a huge epic closing track, that’s a trade I can live with. On the whole the second half is stronger than the first half, with three of the four faster songs coming later in the album, while the closing track “Sad Mystic Moon” is also fantastic. The weakest individual track is probably the ballad “Custode Di Pace”, but even that is still a nice song. 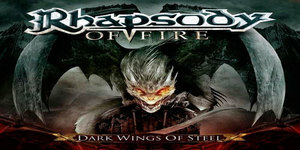 So, now that both new versions of Rhapsody have released an album, it’s clear neither band will be continuing with the exact sound found on the more recent albums, but fans of their earlier works who can live with some slower songs and the lack of an epic 10+ minute closing track, are sure to enjoy Dark Wings Of Steel. I won’t say it’s one of my absolute favorite Rhapsody Of Fire albums, but it’s certainly a great album, and I very much look forward to hearing more from this lineup in the future.